Recent stories in The Nation and Huffington Post have criticized Fox News personality Bill O'Reilly, then a young TV reporter for CBS News, for his role when the US government and US mass media turned a blind eye to the 1981 massacre at El Mozote. O’Reilly was sent by CBS Evening News to El Salvador. In his words, he was sent “to check out an alleged massacre in the dangerous Morazán Territory.” This had to have been the El Mozote massacre. No other massacre was being reported on in the press that would have caught the attention of CBS news editors. How challenging is this first election to allow "cross voting" where voters can choose legislators from multiple parties? Two things to watch for: delays in counting the ballots and an increased number of "impugned ballots" where the ballot is void because a citizen voted incorrectly.Does the FMLN win back the cities surrounding San Salvador such as Apopa, Ilopango and Soyapango that it lost in the 2012 elections? Does the trash crisis in the streets of Mejicanos lead to a replacement of the City's ARENA mayor? Global football star and UNICEF Goodwill Ambassador David Beckham has lent his name and celebrity to UNICEF's "¿No te indigna?" campaign to end violence against children and adolescents in El Salvador. Watch his video. When I began writing this blog ten years ago, one of the first stories which I covered regularly was the November 2004 murder of Gilberto Soto. Soto was a Salvadoran born Teamster from New Jersey. While in El Salvador in 2004, he was gunned down outside his mother's home. The police called it a domestic dispute, arresting gang members allegedly hired by Soto's mother-in-law. She was ultimately exonerated. Others were sure that it was related to his union organizing efforts among truckers in El Salvador's ports. Other theories tied the killing to connections to drug-trafficking and a criminal cartel known as the Perrones. First he was one of El Salvador's most popular and independent television journalists. Then he became El Salvador's first president elected from the left wing FMLN. Now, Mauricio Funes has taken to social media to express his opinions about politics and issues facing El Salvador. And he's not mincing any words. Funes makes his comments available on Facebook and Twitter. His Facebook page is titled Mauricio Funes Sin Censura -- Mauricio Funes Uncensored. On Twitter his handle is @FunesCartagena. In addition, Funes broadcasts weekly 60-75 minute long commentaries on his YouTube Channel. DISCLAIMER -- I am about to write on a topic on which I know nothing: the Central American Parliament. But according to a recent poll, 85% of Salvadorans don't know much about it either. Still on March 1, voters will cast their votes for El Salvador's twenty deputies in the Central American Parliament, known by the acronym PARALACEN. The member countries of PARLACEN are Guatemala, El Salvador, Honduras, Nicaragua, Dominican Republic and Panama. (Costa Rica has not joined). It is the political arm of the Central American Integration System (SICA), founded in the late 1980s to "strengthen the dialogue, the common development, democracy and pluralism as fundamental elements for peace in the region and for the integration of Central America." 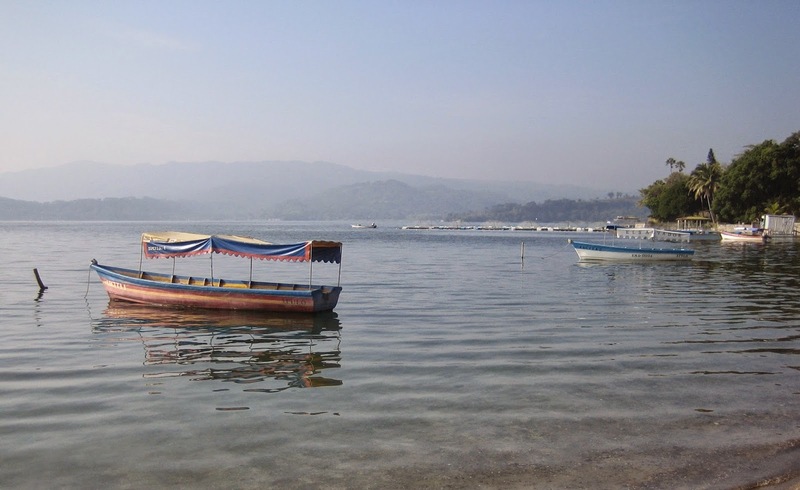 For a small country, El Salvador has a lot to offer visitors. El Salvador's tourism ministry has been working to package this up and attract visitors from throughout the world. According to government officials, tourism has grown 27.3% from 2009-2014 with 1.9 million international visitors in 2014. Tourism revenue in 2014 was $1.1 billion, or 3.9% of GDP. The country has a slick new tourism website at http://elsalvador.travel. The slogan "El Salvador -- the 45 Minute Country" is a little odd (really -- that's the slogan), but I get the point. Because the country is so small, everything from mountain ranges to coconut palm-lined beaches is within driving distance. (Although many of those drives are going to be longer than 45 minutes). Salvadorans view crime as the top problem facing the country.The FMLN will have the most votes for deputies in the National Assembly (somewhere around 35-40%), but will not achieve a majority. ARENA will have the next highest vote total. Nayib Bukele will win in San Salvador, allowing the FMLN to retake the mayor's office in the country's largest city for the first time in six years.Most voters will vote for deputies by marking the symbol of their preferred political party, but a measurable number (10-20%) will engage in newly permitted "cross-voting" for candidates of multiple political parties. You can view all the poll results at the links below. 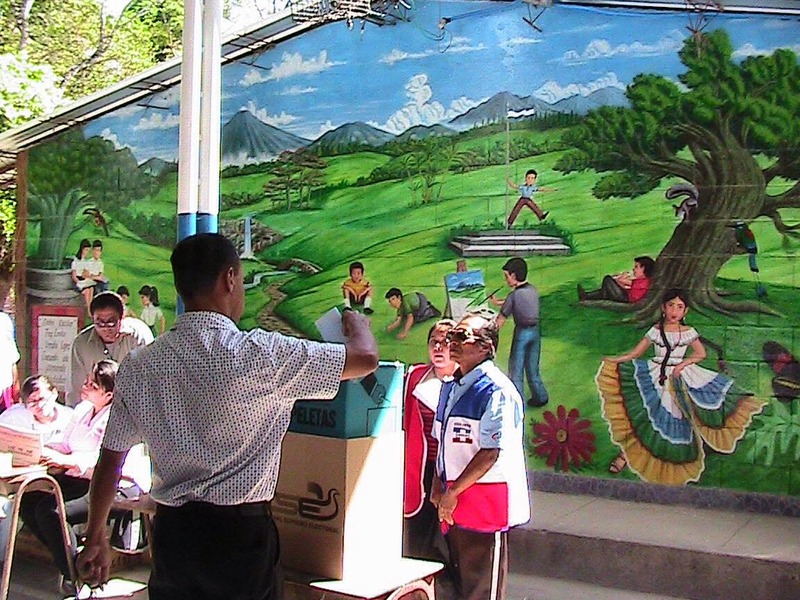 On March 1, Salvadorans will go to the polls for national elections. They will be electing mayors, deputies to the National Assembly, and deputies to the Central American parliament. Due to rulings by the Constitutional Chamber of El Salvador's Supreme Judicial Court, for the first time Salvadorans will be able to select deputies from different parties. In the last election, if you selected a candidate from one party, you could not vote for any candidates from another party. This year for example, voters in the department of San Salvador will choose 24 deputies from a menu of 173 candidates -- 24 candidates from each of 8 parties and one independent candidate. The Supreme Electoral Tribunal is in the midst of a public education campaign to explain these changes to voters. The TSE ha set a tutorial on the rules for voting for citizens here with the caption "VOTAR ¡ES FÁCIL! -- Voting is Easy!" There is an epidemic of chronic kidney disease (CKD) in El Salvador and Nicaragua. It has been a mysterious disease without enough study and data to determine its causes. Many of the victims have been sugar cane workers in the Central American countries. While this blog and other media covered the announcement that Rudy Giuliani's security consulting firm would be coming to El Salvador as an adviser on security issues, little attention has been paid to the actual work product of the National Council of Security and Coexistence (CNSCC). This was the council drawn from various sectors of society by the government of Salvador Sánchez Cerén to develop solutions to the country's public security problems. The CNSCC delivered its proposal to the president in mid-January. The proposal is called "Plan El Salvador Seguro" -- "Safe El Salvador Plan." It is a $2 billion five year plan which is comprehensive, and ambitious in scope. The Executive Summary for the Plan can be found here. Oscar Romero's Path to Sainthood a Cause for Rejoicing... and Not Just for Catholics | Rev. Canon C. K. Robertson, Ph.D.
El Salvador's Supreme Court made public today that it had ordered the corruption case against former president Francisco Flores transferred to a new judge. Twelve of the Court's 15 justices agreed that the Flores matter should be removed from the court of Judge Levis Italmir Orellana. The Court also sanctioned Orellana for failing to respond to a request from the country's Human Rights Ombudsman (PDDH) for an explanation of why Flores was allowed house arrest after being a fugitive from justice for several months before turning himself in. This is a positive step for El Salvador, with the Supreme Court taking a step both against corruption and incompetence. Ex-president Francisco Flores has been arrested and charged with corruption with respect to the handling of a $15 million donation from the government of Taiwan in 2001. The ocean-going leatherback sea turtle is the largest of all living turtles and can swim across the entire Pacific ocean following its primary food, jellyfish. 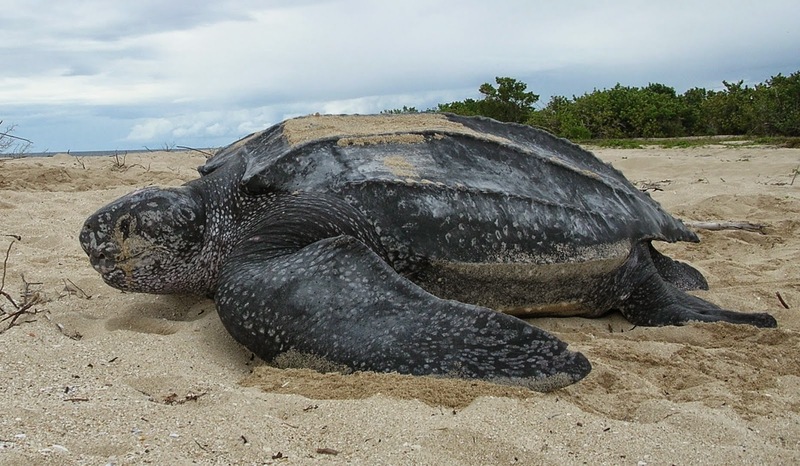 The Pacific beaches of El Salvador are one place where leatherback turtles come to nest. This week ecologists working with El Salvador's environment ministry watched as 39 hatchling leatherbacks crawled along the sand of a protected natural area in Sonsonate and out towards the ocean. The little turtles had recently hatched from eggs specially watched over by the scientists. The leatherback is in significant risk of extinction. As much as 80% of the world's population of these turtles has been lost in the past 10 years. Many more programs like these programs run by El Salvador will be needed to protect these ancient creatures of the sea. When I was in San Salvador last week, I knew immediately that the FMLN was running a different kind of candidate in a different kind of campaign for mayor of El Salvador's largest city. All the campaign signs for Nayib Bukele, the FMLN's candidate are in blue and white -- no sign of the red which has always signified the left, nor is there any sign of the party logo. The signs say simply "Nuevas Ideas -- Nayib 2015". 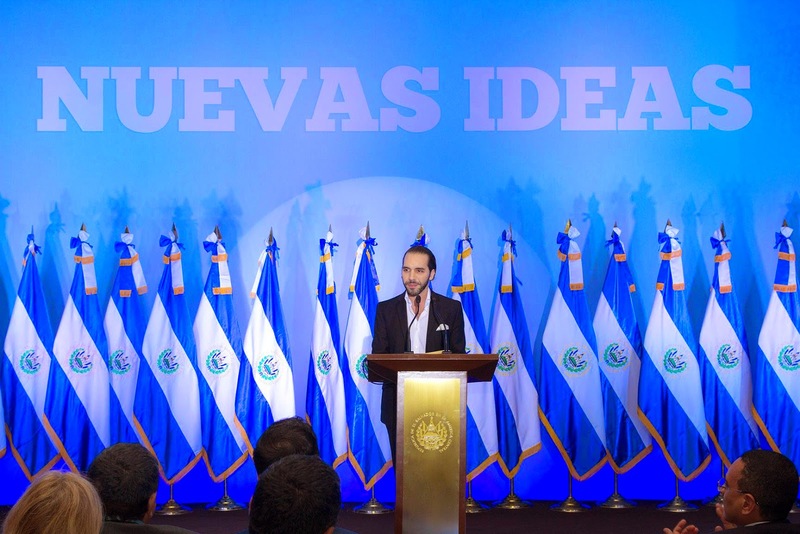 Taking a page from the playbook of Mauricio Funes, who always campaigned in a white shirt -- never in red, Bukele has simply elected to use the colors of the country's flag. (Although to my mind, his color scheme really seems more like the corrupt, right-wing PCN party). He is hip -- a candidate to appeal to the younger voter in the capital city. The young businessman turned mayor of Nuevo Cuscatlan almost never wears ties with his suits, but always open neck shirts. Church bells rang out across El Salvador today with the news that Pope Francis had signed a decree that Oscar Romero will be beatified as a martyr who died for the faith when he was gunned down by an assassin's bullet while saying mass on March 24, 1980. The date of the beatification is being determined by the Vatican, but the place will be the Salvador del Mundo monument and plaza in San Salvador. For me, Oscar Romero has always been a source of great inspiration and a model of a true commitment to peace and justice for the most marginalized members of society. His image is everywhere in El Salvador as the people remember the voice of the voiceless, who walked as a shepherd of the suffering people of El Salvador before his murder in 1980. 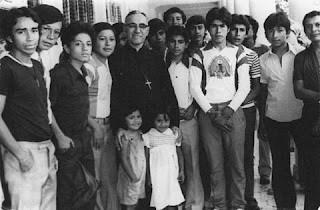 If you have not spent much time with Romero, here are some great resources to gain a deeper appreciation for his life and what he meant for the people of El Salvador. Whether you should "dialogue" with gang members or shoot them on sight is an active debate in El Salvador. The debate is front and center as the year began with a spate of murders of police followed by a purported unilateral cease fire by some of the country's gangs. Protestant churches which make up the IPAZ effort favor an approach to the country's gang problem which includes dialogue with the gangs. Leaders of the churches were making visits in January to prisons in El Salvador which they characterized as "pastoral," including worship services. The churches pointed out that they were not negotiating with the gang leaders they met since the churches have no authority from the government to act as mediators.